Stun Batons are a favorite among law enforcement personnel, security guards and bounty hunters, as well as regular citizens because of their take down power and extended reach. Simply touch an assailant with the Stun Master 20,000,000 Volt Metal Stun Baton and Flashlight and press the trigger button. This will leave the assailant dazed, off his or her feet and temporarily paralyzed! This 3 in 1 Stun Baton is the first combination of its kind made out of aircraft quality aluminum. It features a high end tactical flashlight and a powerful 20,000,000 volt blast of electricity that will disable even the largest, most combatant assailants. 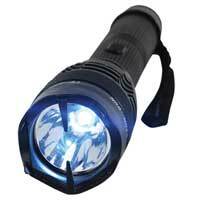 The 120 Lumen super bright LED flashlight will provide that beacon of light in a dark and scary world. With its firm rubberized grip and wrist strap this Baton can easily be used as a heavy duty club. At the front end of the baton is a jaw dropping 20,000,000 volt stun gun. The baton emits an electrifying shock with the simple ease of pushing a button. The baton Includes charger cord. Measures 14 ¾” x 1 ½” and has a lifetime warranty. 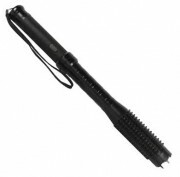 This Stun Master 20,000,000 Volt Metal Stun Baton and Flashlight can be delivered in 3 to 5 business days. If you would like to receive your order sooner, guaranteed 3 day, 2 day and next day delivery options are available upon checkout. Orders placed by 2:00 PM central time ship the day they are placed. If you have any questions or concerns call our customer support staff at 800.960.2015 or click the live chat button at the bottom of this page. Our courteous and professional customer support team is always glad to help!